Not everyone enjoys painting or watching it dry. But there are few wooden boat owners who don't relish the moment when they step back and admire the results. All the effort involved in preparing and finishing will then be seen to have been worth it. The promises made on the tin are worthless unless the surface is properly prepared. Even where you are merely touching up sound paint the surface must be sanded to provide a key so the new will adhere well and survive for more than one season. This is important regardless of whether you are aiming to achieve a smooth glossy 'yacht' finish or just a protective 'working boat' finish. A disc sander can be used with care on flat areas, but as there aren't many of those on a boat a better option is to use a palm-sized orbital sander. However, I have found that it is actually faster and more efficient to sand by hand. Normally I just use a sheet of production sand paper folded in four, you can if you wish use a backing pad, preferably one which is firm yet flexible enough to conform to any curvature of the wood. For sound paint a 120-grit paper should be OK, for rougher patches you can use the coarser 100 or even 80 grit. For varnish work always sand along the direction of the grain of the wood and not across it, even for paint work sanding along the grain will make any scratching less obvious. Anywhere where the paint is lifting, blistered or has flaked using scrapers is a better way to fair and smooth the surface. Scraping is not quite as simple as sanding, so take care and keep the scraper sharp. Begin by scraping the old flakes off then feather and smooth to blend the exposed area level with the surroundings. Then finish off by sanding. Now that you have the surface rubbed down to your satisfaction do any filling that is needed. Before beginning painting clean off all traces of dust. A vacuum cleaner is the most effective method for removing sanding dust. All bare wood needs a primer coat before starting on any top coats, regardless of what it may say on the tin. You'll need at least one coat of primer preferably two. Many owners and builders of solid wood boats like to protect the wood from worms, marine borers and the like. There are several wood treatment products available but for me good old cheap creosote is favorite. Not only is creosote cheap and effective against borers but it will also penetrate well into the wood. However, only oil based finishes can be used over it and it must be given plenty of time to dry thoroughly, paint applied onto wet creosote will never dry and I mean never. When selecting a primer for your hull I would recommend the metallic gray type. These primers contain millions of microscopic flat aluminium particles which, so I'm informed, make them more impervious to water penetration than the pink primers. The gray primers also contain anti-mold, biocide agents. For best results apply at least three coats below the waterline and at least two above, sanding with 120 grit between coats. Sanding will produce a lot of very fine gray dust, so wear a face mask, and if its at all windy watch where the dust is settling, your neighbor wont be happy if his sparkling white topsides are sprinkled with dull gray. With the gray primers there is a time limit between sanding and applying the next coat, so check the instructions on the tin. First, I must point out that I prefer to use a brush rather than a roller. Excellent results can be obtained with the roll and tip method, however this is best done with a helper. New brushes should be given a good clean then hung overnight to dry this will get rid of any shop soil and help prevent bristle loss. On wooden boats it is best to stick to the traditional type of oil based finishes, two part paints are not only expensive but also tend to be less flexible. Because wooden boats flex and work, especially along the seams the expensive finishes will not last any longer than the traditional types. 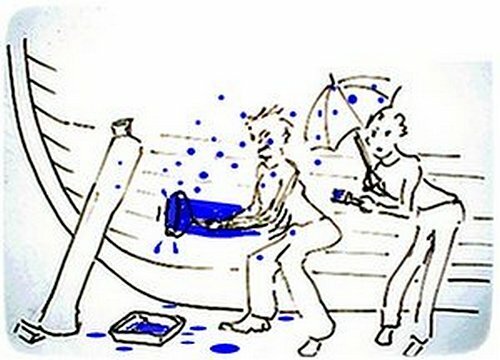 For the most durable and even, color coverage, most marine coatings will require three coats, sanding between each coat. Allow each coat 24 hours to dry, sand lightly and clean off all dust between coats. There is no hard and fast rule about where to start but generally starting at the top and working down seems to be the best approach. The main thing is to work away from the fresh wet area so you don't drip on it or catch it with a sleeve, or even sit on it as I once did. In order to keep that wetted edge it may be necessary to thin the paint accordingly. Paint will dry faster on warm, dry days when there is a bit of a breeze especially on horizontal surfaces. There are some special liquid additive that can helps with the flow and slow the drying, however these are just thinners which have a high oil content. I don't like the edge that is left when using masking tape. So, I try to keep any color change to lines where there is a definite change in surface direction, as in the joint between cabin side and deck. And I always overlap the two colors finishing with the stronger color. These joint areas are places which are particularly vulnerable to water ingress, so it is important that there are no gaps in the paint. I have never been keen on using a roller. It is so easy to end up with a pebble dash finish. Advocates say that it is a quicker method than brushing, yet to get a good finish requires two people, one rolling on the paint while another follows closely with a bush to do the 'tipping'. And all the awkward spots and edges still need to brushed. Still, I suppose that if you have one or two helpers who are not very good at brushing it might be a good way to get everyone involved. The person doing the 'tipping' should be the best at using a brush. The 'tipper' then follows closely behind lightly brushing it out. It is important that the two work in consort, so that the tipper can keep up with the roller and always be working on wet areas. I am about to prime my boat, is it alright to use hempel under water primer all over the boat?